My second "Socialists in Congress or Senate" profile deals with Dennis Kucinich (D-Ohio), the new chair of the US Congress' Government Reform Subcommittee. Kunicich is a member and former chairman of the Congressional Progressive Caucus, the approximately 65 strong bloc of congressional leftists. As a member of the CPC, Kucinich, like his colleague Barbara Lee, enjoys the backing of the Democratic Socialists of America. In common with many CPC members, Kucinich has also enjoyed the long term backing of the Communist Party USA. 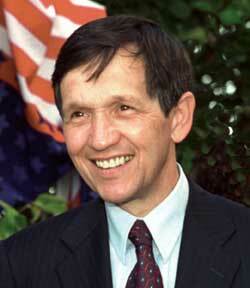 Kucinich was elected to the Cleveland, Ohio City Council at age 23 and was elected mayor in 1977 at the age of 31. At the time, he was the youngest person ever elected to lead a major American city. Cleveland was then, as now, a major stronghold of the Communist Party USA. The Communists were and are very influential in local Democratic Party politics, from local to congressional level. Take Kucinich first. As mayor of Cleveland...., he represented one of the most ;left; elements in the Democratic Party during the heyday of the radical protest movement. He was closely allied with the Stalinists of the CPUSA, who still had significant influence in the working class of Cleveland, particularly in such unions as the UE and UAW. With the collapse of the protest movement and the shift to the right in American bourgeois politics, Kucinich was driven out of political life for two decades, before returning to office as a state legislator and ultimately winning a congressional seat. Kucinich is regarded as one of the most vocal leftists in Congress and one of the most closely affiliated to organised labour. Writing in the Communist Party USA's People's Weekly World of November 23, 1996, OhiCUP'SSA chairman, Rick Nagin, explained the campaign which led to Kucinich's election to Congress. The election of Dennis Kucinich in Ohio's 10th Congressional District was a ground-breaking event demonstrating the powerful political potential of a mass, grassroots coalition led by labor. Trade unionists and seniors provided the largest numbers of some 5,000 volunteers but many others came from Hispanic, environmental, peace and other organizations. The staff estimated that the volunteers made 100,000 phone calls and mailed out one million pieces of literature. Many organizations issued their own literature and did their own mailings including the AFL-CIO's Labor '96, the UAW CAP Council, the Sierra Club, Peace Voter '96, gay rights and senior groups. The United Auto Workers and the Steelworkers did plantgate distributions. The Ohio Council of Senior Citizens distributed 12,000 pieces with the positions of Kucinich and his opponent, incumbent Martin Hoke, on senior issues to senior buildings, nutrition sites and bingo games. The coalition embraced many political viewpoints: Democrats, independents, Greens, socialists, Communists, members of the Labor Party, even some disgruntled Republicans. Democratic Party figures, including First Lady Hillary Clinton, Congressmen Louis Stokes, Joseph Kennedy and Barney Franks visited Cleveland to help in the effort. But it was the grassroots, labor-community coalition that Kucinich had in mind on election night when he gave his impassioned victory speech with jubilant leaders of organized labor standing behind him, their right fists held high, chanting, "We are the party of the people! We are the party of the people!" The coalition was inspired by both Kucinich's personality and his program. Alarmed at the obvious communist influence in Kucinich's campaign, his Republican opponent, Martin Hoke and his team, fought back hard. The Republicans reacted with fury to this open challenge to their decades of labor-baiting bully tactics. Kucinich's program, Republican county chairman Jim Trakas announced, is "very similar to the Communist Manifesto" and is "what Lenin stood for." Kucinich blasted this reversion to "McCarthyism." The Republicans focussed on CPUSA leader, Rick Nagin who they alleged was very influential in Kucinich's campaign. The smears were endlessly propagated by a right-wing talk show host who made it his mission three hours every morning to stop Kucinich. The poisonous attacks, aimed at suppressing voter turnout, caused the race to tighten considerably. In the final week before the election the focus of the Hoke campaign shifted to virulent red-baiting directed at this writer (Nagin). In what was probably a first since the beginning of the Cold War, Kucinich refused to knuckle under, calmly stating that I was one of 5,000 volunteers and declaring, "It's Halloween and Hoke is dressing up as Joe McCarthy. Karl Marx is not running my campaign but apparently Harpo Marx is running his." On Nov. 5 Hoke was defeated by a vote of 108,000 to 102,000 with 10,000 going to a candidate of the Natural Law Party. It was a stunning rebuke to Hoke's shameful attempt to whip up hatred and hysteria. Although he spent a million dollars - over twice as much as Kucinich - he could not shake the solid majority of voters who showed outstanding maturity. Nagin also had seven and a half years of experience as executive assistant to Nelson Cintron Jr. who represented an adjacent ward. Furthermore, he had been a key organizer for Dennis Kucinich's campaigns for Congress and president and for the 2004 John Kerry presidential campaign. Just "one of 5,000 volunteers", Mr Kucinich? The CPUSA clearly sees Kucinich as a man worthy of support and someone who can be relied on to push the correct agenda in Congress. In a 2004 report to the CPUSA National Board, the Party's Political Action Committee chair, Joelle Fisman wrote a report on Party work in the US Presidential elections. Dennis Kucinich's 50 delegates to the national Democratic convention, will be presenting a platform plank for a Department of Peace, voted favorably by four state conventions, including dramatically in Texas just this week. The efforts of Kucinich together with Jesse Jackson and others, to bring forward more advanced demands, will make an important contribution to the convention. A very special contribution will be made by an expectedly large number of labor union delegates who will work together in one bloc to get a strong platform for jobs, health care, and pensions. We project our role at the convention as distribution of the Peoples Weekly World/Nuestro Mundo and literature to delegates and in free speech areas, and participation in the Kucinich-led issue events. We hope to have reporters inside the convention, we hope to speak with any labor delegates we know in their home states before the convention, and to participate in the Boston Social Forum which will be held the weekend prior to the convention. This is classic Communist Party USA tactics. Develop policy-give it to sympathisers or secret members inside the Democrats and get them to push it through as party policy, with just a little communist help. Lynn Woolsey a leader of the Progressive Caucus. Two leading members of Democratic Socialists of America, actor Ed Asner and feminist writer Barbara Ehrenreich. Aging folk singer, Pete Seeger, formerly a longtime member of tCUP'SUSA and now a member of its offshoot, the Committees of Correspondence for Democracy and Socialism. 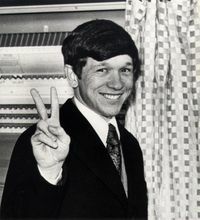 When it became clear he had no chance of victory, Kucinich threw his weight behind the eventually successful Democratic contender, John Kerry. 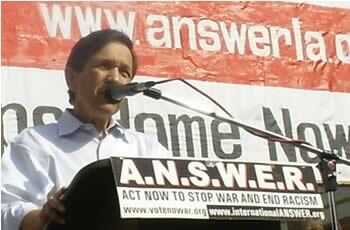 Dennis Kucinich continues on as one of the most openly socialist members of the US Congress. He has spoken on anti war platforms of the Workers World Party's ANSWER coalition and backs every socialist measure going. He plays a leading role in the newly formed Progressive Democrats of America a socialist platform within the wider Democratic Party which was formed by people involved in his Presidential campaign. Unsurprisingly PDA also has ties to the Congressional Progressive Caucus, the Deomocratic Socialists of America and the Communist Party USA. This fellow Dennis Kucinich is really far left fellow. No wonder Communists in the Communist Party USA seem to be quite fond of him. It should also be of note that the Democratic Socialists of America is linked with the Socialist International a international "socialist" movement that has links to Mikhail Gorbachev along with old Cold War KGB-trained groups such as the Sandinistas, various African Communist parties and even the Social Democrats USA which strangely supports U.S. foreign policy which I believe is really a method of infiltration consider why someone like Henry Kissinger would suggest that the Iraq war is unwinnable. Yes MAH. I believe the Socialist International is now firmly aligned to the communist movement. This has been achieved partly through SI's willingness to accept crypto communist groups like the Sandinista's ANC and the "former" Italian communists.